Saturday night at the outskirts of Madrid a newly formed Barcelona side is struggling to gain three points against a resolute Getafe side. In the 29th minute recently signed, Ousmane Dembélé had to go off with an injury—he will miss four months—and then ten minutes later Gaku Shibasaki makes it 1-0 for Getafe. 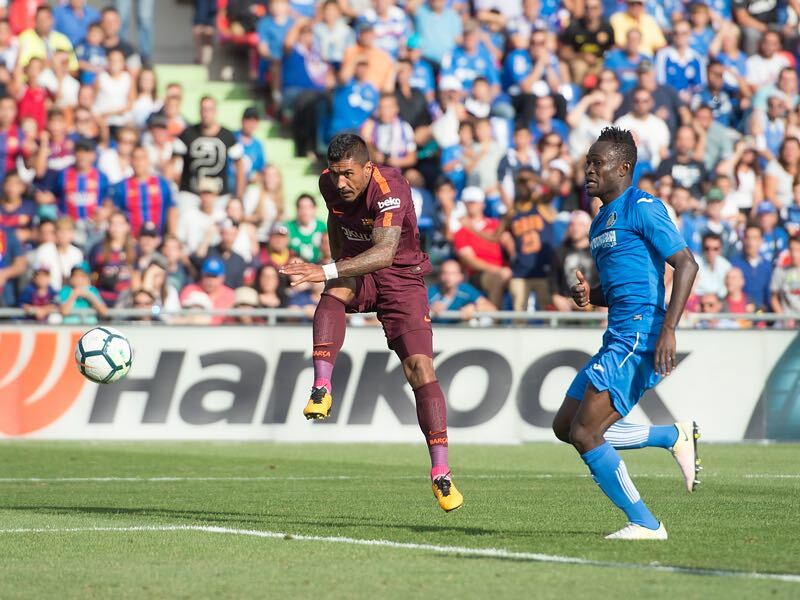 Denis Suárez would then equalise in the 62nd minute, but Getafe seemed hell-bent to take a point until Paulinho became the hero in the 84th minute with a late winner for Barcelona concluding a story that began at FC Vilnius in Lithuania. Guangzhou paid €14 million for a midfielder, who had fallen from grace at the White Hart Lane. At the time the transfer was considered a good deal by Hotspur’s owner Daniel Levy. For Guangzhou, in the meantime, the acquisition of Paulinho was considered the creation of Brazilian trademark. The club signed several Brazilians, and many Chinese Super League clubs followed the model primarily focusing on players from South America in a desperate attempt to raise the game of China’s football. With millions on the table and Chinese clubs paying salaries that were beyond those of even the biggest clubs in Europe, it was widely understood that European football would never see Paulinho again. But they were wrong. This summer Barcelona made an extraordinary step moving in on the Brazilian national team midfielder and signing him to a deal that was not without its controversy. Spanish media would later claim that Barcelona had paid too much for the player and that Barça’s president Josep Maria Bartomeu had used business contacts in China to gain a personal advantage from the deal. The Spanish paper El Pais highlighted business contacts between Bartomeu’s companies and the Evergrande business conglomerate that owns the Chinese football club. Bartomeu and Barcelona later declined any possible connections between the club, any of its officials and Evergrande. Nonetheless, Paulinho’s €40 million transfer from Guangzhou to Barcelona somewhat concludes a football story that has been anything but ordinary. Eleven years ago Paulinho was as far away from Barcelona as earth is from Mars. In 2006 the midfielder joined an ambitious Lithuanian A Lyga club. Founded in 1974 as Šviesa the club played most of its existence in the lower echelons of Soviet football. It was then only thanks to the fall of the Soviet Union and the independence of the Baltic States in 1990 that Šviesa had a chance to reach professional status. In 1990 the club took part in the first Lithuanian championship playing in the third division, I lyga finishing in the third spot. The club would remain in the lower echelons of Lithuanian football until the early 2000s and was then renamed FC Vilnius in 2004. The renaming of the club would prove to be a significant event in the club’s history. It was right at the time when the Lithuanian businessman Algimantas Breikštas took over as the owner of the club. Speaking to the Futbolgrad Network, the Lithuanian football expert Justas Kontrimas explained that Breikštas was an active member in Lithuania’s football scene. Before starting his project in Vilnius, the businessman owned some shares of Sūduva club in Marijampolė before going for rejuvenation of FC Vilnius. Breikštas had built his fortune by owning the ‘Marijampolės pieno konservai a large milk conglomerate based out of the Lithuanian city of Marijampole. As the owner of one the largest milk processing companies in the Baltic States Breikštas quickly rose up the ranks of the post-Soviet oligarchs that sprung up like mushrooms in fall following the collapse of the Soviet Empire. As a post-Soviet oligarch, it would only be fitting to own a football club, and no football club owned by a post-Soviet oligarch is complete with a set of Brazilians. He therefore frequently travelled to Brazil to create business connections with clubs in the country. Breikštas did not hide that he established these relationships with the Brazilian clubs by going to youth tournaments. Kontrimas tells the story on how Breikštas discovered Paulinho. “He was attending one of these youth games in Brazil when he found Paulinho. They agreed for a sum of €75,000, but half of the rights belonged to Pão de Açucar.” Like FC Vilnius Pão de Açucar were founded in 2004—since renamed Audax São Paulo FC Vilnius and Pão de Açucar established a cooperation agreement. The players were supposed to use Lithuania as a jumping off point to be discovered by bigger clubs in the region. Paulinho, in fact, was not the only Brazilian signed by Breikštas in 2006. Alongside Paulinho FC Vilnius also signed Kleyr (AA Anapolina), Alemão (Penafiel), Everton (Galo Maringá), Andreson, Muller and Juca (all from CA Juventus). They joined a squad that already included three Brazilians most prominently the defender Rodnei, who would later have a decent career in Germany playing for the likes of Hertha, Kaiserslautern, RB Leipzig and 1860 München. Oligarch + Football Club + Brazilians = Success? Signing all those Brazilians was part of an investment strategy. In the early 2000s, the world transfer market started taking off and with the expansion of the European Union as well as UEFA competitions it became easier to play non-European players and showcase them in the various UEFA competitions. The math was simple: sign a bunch of Brazilians and hope that at least one or two of them show the talent for one of the big leagues. For Paulinho, the path via Lithuania was certainly the first step to a world career. The 17-year-old managed to work his way in the first team playing 38 games in his first two seasons and scoring five goals. Unfortunately for him, however, his performances were not enough to keep the club in the first division. At the end of 2007, FC Vilnius were relegated, and Paulinho was deemed too much of a talent to rot in the lower echelons of Lithuanian football. Luckily for him, Breikštas had moved on to better and brighter things. The businessman started investing in Polish football buying ŁKS Łódź. Breikštas, therefore, moved Paulinho across the border to play south in the Polish Ekstraklasa. Paulinho would play there for one season making 17 appearances without scoring a goal. Following the 2007-08 campaign he returned to Pão de Açucar from there, he would move to the Serie B side Bragantino before joining Brazil’s biggest club Corinthians. For Paulinho, the rest remains history as his path would lead him from Corinthians to London to China and then finally to Barcelona. Paulinho and his move to the top of the European game highlight the intricacies of the modern game. Football today is global, and players are often shipped from one part of the world to another before they reach the pinnacle of the match. Furthermore, the collapse of the Soviet Union meant that a largely unchecked market opened in Europe that was intertwined with European competitions. The example of FC Vilnius and Paulinho, in fact, is just one of countless examples of post-Soviet clubs that tried to build a foundation through the trade of South American players.